TAB event data on your Sony TV! Another new application built using TAB’s event data made available via our recently released API. We love our users creativity and support and are looking forward to more apps like this in 2009! One of our TAB users, already maker of the great Google Map of art events in Tokyo, has built an Applicast widget for Sony Bravia TVs. The widget displays TAB’s event data, in a little box on your TV screen, over the program you are watching. 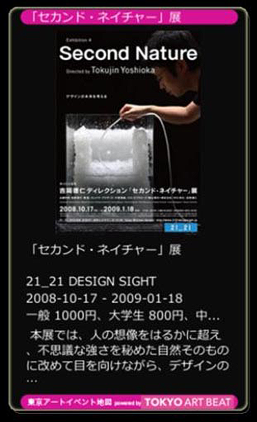 It refreshes every minute with a selection of art and design events (including posters) and it can be expanded to show more details including a description, location and pricing, as well as a QR code to the event’s full details on TAB’s mobile phone site. The widget is currently being reviewed by Sony and should become available to Bravia set owners shortly now available from your Sony TV set. More details on Sony Bravia’s site.